Because we've already started talking about Mastermind Japan today, we'll continue the trend into our Jeans! segment. In late 2008 MMJ got together with Levi's Fenom (Hiroshi Fujiwara's line under the Levi's Japan umbrella) and produced about 100 pairs of MM505-001 one wash jeans. They have the look of a raw jean but are soft to the touch with a unique indigo color due to the wash technique applied to them. 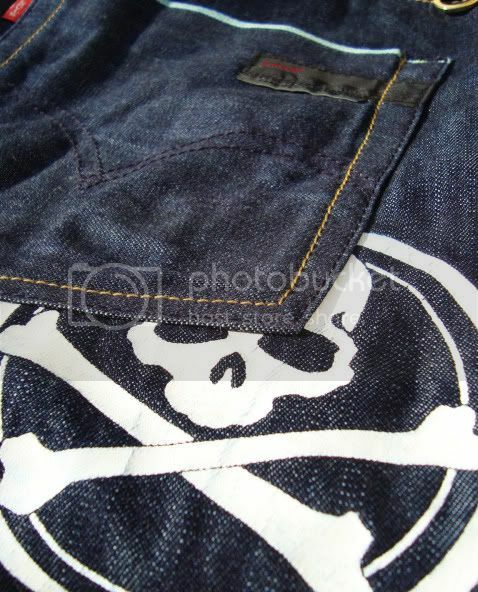 Most importantly though, they feature the large Mastermind Japan Skull just below the right back pocket. solifestyle has a pair to show you. The MMJ x Fenom jean is a streetwear enthusiast's dream- the hype and logos of Mastermind Japan at a pricepoint half as much as a pair of MMJ jeans. Needless to say, at release the lineup in front of the Contemporary Fix in Tokyo was very long and the jeans which retailed at $550 sold out instantly via raffle drawing. Today you'll have a hard time even getting a glimpse of these jeans and if they do appear for sale, expect to pay over $1000 to get a used pair. As far as denim goes, have a very unique indigo color that seems to shine in sunlight. But wearers beware the indigo bleeds all over your shoes, shirt and any other garment they come into contact with. The right back pocket has the signature Levi's arc stitching and Levi's red tab. 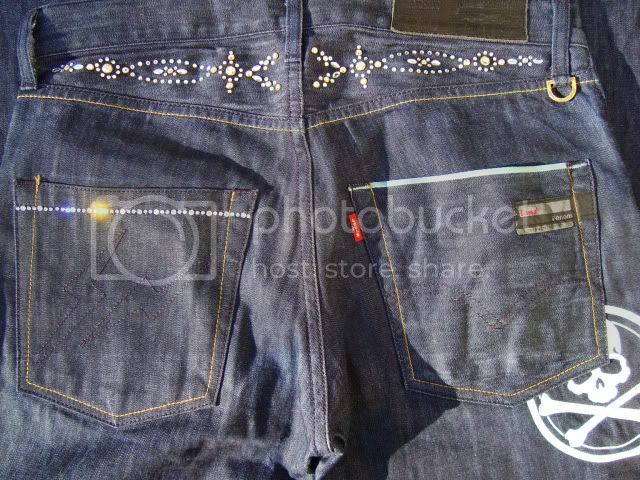 The left back pocket has the Fenom lightning bolt stitching and is adorned with Swarovski Crystals. 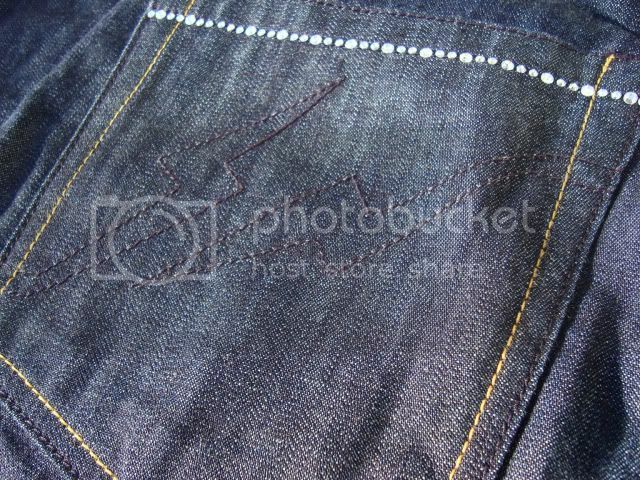 The yoke of the jean also has a design made of Swarovski Crystals but this portion of the jeans remains hidden by your shirt so you wont get a chance to show off your crystals unless you like to wear them while you do yard-work. The standard hardware has been replaced with gold hardware true to MMJ's commitment to use the highest quality materials. The one complaint that people had with this pair of jeans is that it was produced on a very light denim maybe as low as 10 or 11oz so it is not very functional for the winter months but it is great to wear in the summer when some heavier jeans are not an option. solifestyle recognizes that these jeans are more valued for their brand name and logos than for their quality and construction. Also, the crystal embellishments will definitely not appeal to everybody but when you consider that most of the crystals are covered when worn, it is pretty cool to have a giant skull below your back pocket especially on a very subtle, dark looking jean. Take a look at the details below and let us know what you think of the MM505-001. 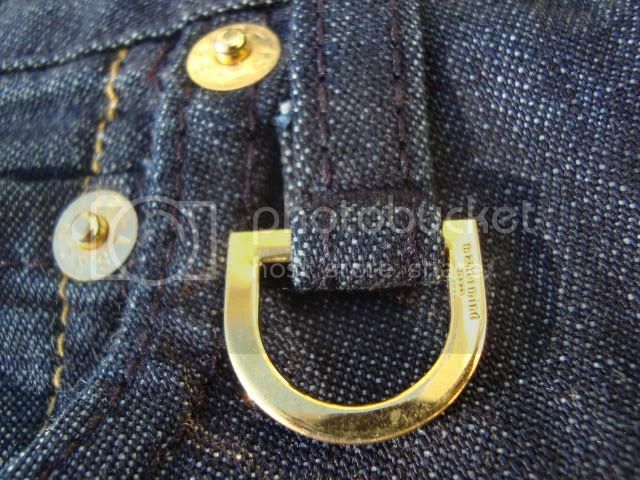 This pair of jeans has gold hardware and two gold d-rings which have the mastermind branding on them.